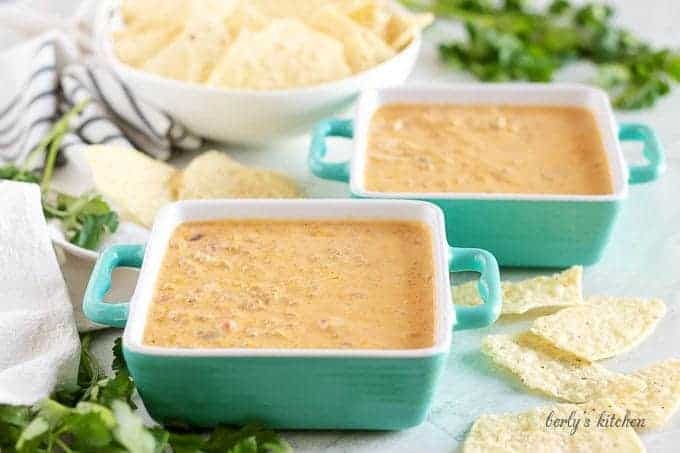 Seasoned Beef Queso Dip is the perfect recipe for your next family gathering, sporting event or holiday party. Homemade cheese sauce pairs with seasoned taco beef, tomatoes, onions, and green chilies for the ultimate snack to share. 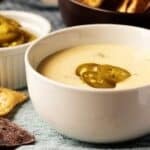 We published our beef queso dip in October of 2016. A lot has changed since then. I like to think we’ve improved in both style and substance over the years. It’s strange to think the website will be four years old in November of this year. Man, time certainly flies when you’re having fun. Originally, the blog was on a simple five year plan and I’m excited to say, we’re beyond my original expectations. It’s been a labor of love that we hope will be around for many years to come. Okay, enough of that, let’s get down to business, the cheese dip. What can I say about this dish? Well, it’s pretty tasty, that’s for sure. A rich and creamy cheese sauce loaded with seasoned beef, chilies, and tomatoes. Of course, feel free to make your own modifications to the original formula. After all, isn’t that cooking is all about. Finding a recipe you adore, then making those subtle changes to create something new and exciting. That’s one of my favorite aspects of cooking. In time, you’ll get so good at it that you won’t even need base recipes, you’ll just know. In the meantime, I’ve provided some tips below and even offered some ideas on how to change our formula. Let’s get started! You probably already know how I will start things out. That’s right, prep your ingredients. That means dicing onions, opening cans, and shredding cheese as needed for your beef queso dip. Once you have everything ready, it’s time to get cooking. 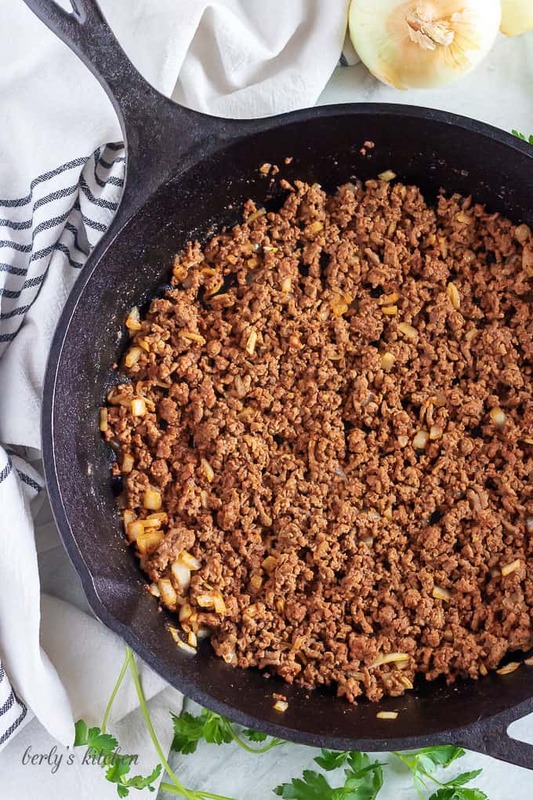 Grab a 13-inch skillet, or deep saucepan, and cook your ground beef with the butter, onions, and taco seasoning. When the beef is done, don’t drain the fat. I know that sounds weird, but hear me out. You’re going to need that extra fat because you’re making a roux. That’s right, fat and flour are the two ingredients that are going to make this dip thick and creamy. Now, sprinkle the flour, evenly, over all the meat. Give everything a good stir and let the mixture cook for about 2-3 minutes. This roux doesn’t take long to cook. If you’re worried about the flour being, “raw,” don’t let it bother you. The flour will cook perfectly by the time the beef queso dip is done. Afterward, carefully pour in the half and half, while stirring all the ingredients together. Add the salt as well. Let the liquid heat over medium heat for about 7-10 minutes (depending upon your stove, gas or electric) until the dip starts to steam. Don not let it come to a boil or you’ll have to go to the tips section to see how to fix it. As steam starts to rise from the half and half, reduce the heat to low. At this point, you can begin adding the shredded cheddar. Only add a handful at a time and whisk the dip until each handful has melted. Continue this process until all the cheese is gone. 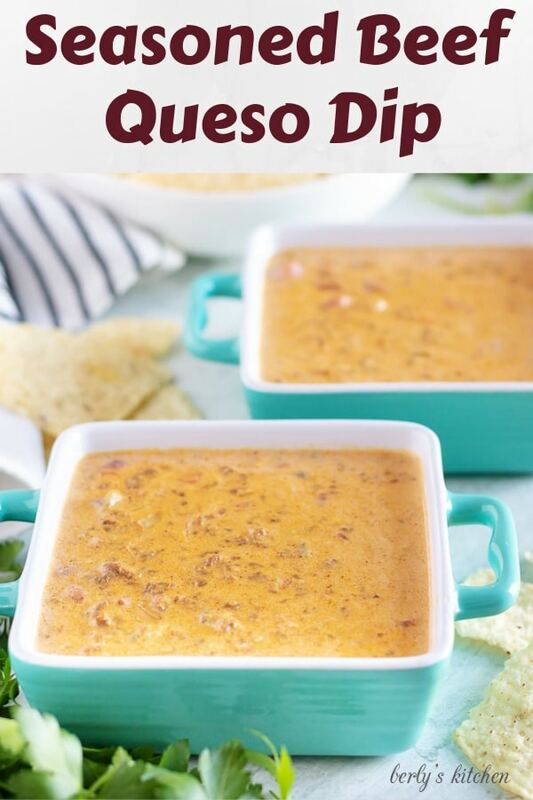 As you may have gathered, making this dip is similar to another cheese dip we have on our site. Now, with the cheese melted, all that’s left to do is wait. 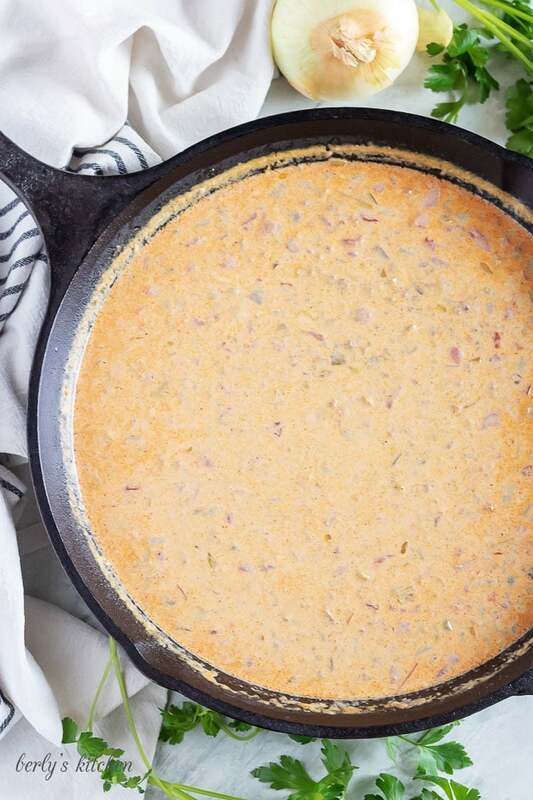 Let the beef queso dip simmer over low heat until it reaches a thickness you’ll enjoy. When the desired thickness has been achieved, remove your dip from the heat and serve it with tortilla chips. That’s it, you’re all done. We hope you enjoy this little appetizer from Berly’s Kitchen. So, I’ll admit it, this dip pretty much screams high-fat, high-sodium, etc. It’s not exactly a healthy option. On the chance that you want to make modifications to cut down on the calories and fat, you have a few options at your disposal. For example, you could use milk instead of half and half. Additionally, you can use low-fat cheese and even substitute ground chicken or turkey in place of the beef. It will have some effects on the flavor and texture, but if you make these kinds of substitutions all the time, you’re probably already used to the changes. For a thinner sauce, simply reduce the amount of flour you use by half. Uh oh, the sauce broke. No worries, you can use a block of cream cheese to fix it. Simply cut the cream cheese into small squares and melt them into the finished dip (over low heat). Want to spice things up a bit? Try adding a 1/4 teaspoon of crushed red pepper or ground cayenne to the beef (while it cooks) to give this dip a little kick. Also, you could just add sliced jalapenos to the dip for flavor and spice. Looking for appetizer options? Then check out some these all-time favorites! 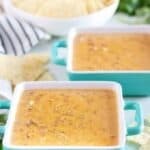 If you like our Seasoned Beef Queso Dip recipe, please leave us a comment and rate the recipe card. You can also find us on Facebook, Pinterest, Twitter and Instagram searching for Berly’s Kitchen! Place butter, onions, beef, and taco seasoning in a 13-inch cast iron skillet or deep stock pot. Cook over medium heat until the beef is brown and the onions are translucent. When the beef is done, do not drain the fat off the meat. Add the flour and stir to combine. Cook for 2-3 over medium-low heat. After that, carefully whisk in half and half. Allow half and half to steam but not boil, then add the salt and whisk to combine. Now, pour in the tomatoes and chilies. Continue to whisk while incorporating small amounts of cheese. Ensure that all the cheese melts before adding more. Let the cheese sauce cook over low heat to thicken. It should take around 5-10 minutes. Once the desire thickness has been achieved, remove it from the heat and serve immediately. The calories listed are an approximation based on the ingredients and a serving size of 1/3 to 1/2 cup of cheese sauce. Furthermore, the calorie count does NOT include tortilla chips (as seen in the photos). Actual calories will vary. 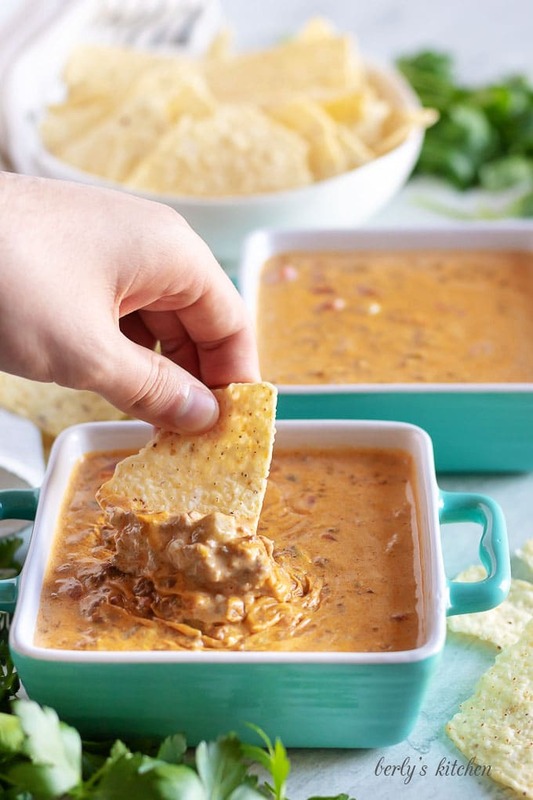 The seasoned beef queso can stored in your fridge for up to three (3) days. This reminds me of a dip my grandma makes! Saving foe later! I am 100% going to try this – sounds so good! This sounds so good! It reminds me of the queso at Chilis! Definitely need to give this a try! YUM! I love queso. I will be making this soon! This dip looks so delicious! I totally want to make this! Ohhhh! I need to save this for football season!